48 hours ago, Apple revealed its new and futuristic iPhone X. Regardless of its design, and debatable price tag, this device also introduced a whole set of functionality, display, and engagement with the end-user. iOS11 is turning to be quite different from previous releases from both user adoption which is still low (~30%) and also from a quality perspective – 4 patch releases in 1.5 months is a lot. Most of the changes are already proving to cause issues for existing apps that work fine on iOS11.x and former iPhones like iPhone 8, 7 and others. In this post, I’d highlight some pitfalls that testers as well as developers ought to be doing immediately if they haven’t done so already to make sure their apps are compliant with the latest Apple mobile portfolio. The post will be divided into 2 areas: Mobile testing recommendations and App Development recommendations. Display and Screen Size for iPhone X specifically changed, and this device has a 5.8” screen size that is different for all other iPhones. 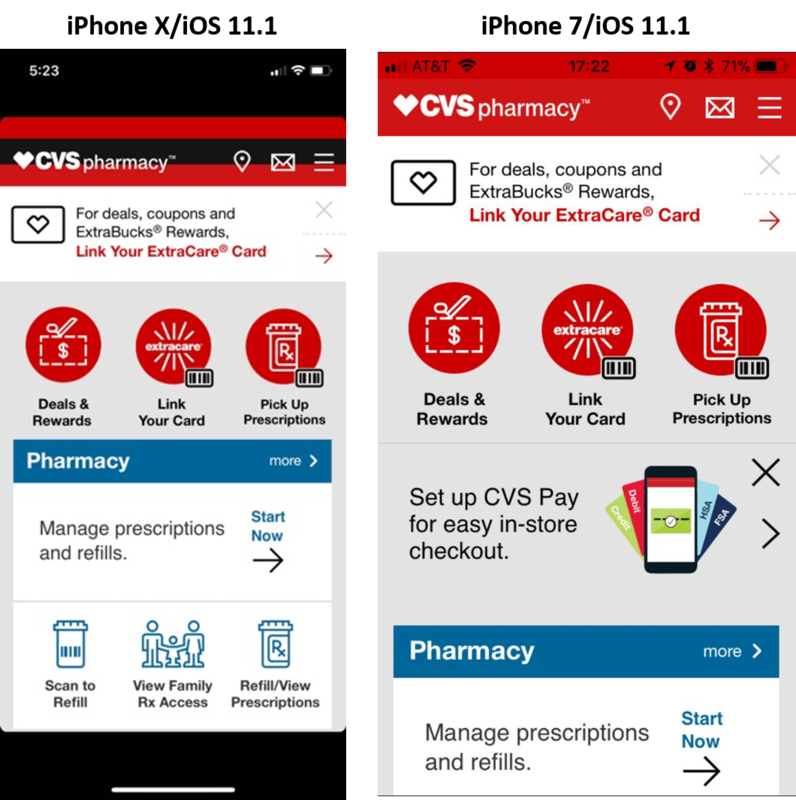 Testing UI elements, Responsive apps layouts and other graphics on this new device is obviously a must (below is an example taken from CVS native app showing UI issues already found by me while playing with the device). This device is also full screen similar to the Samsung S8/Note 8 devices. A lot of tables, text field, and other UI elements need to be iOS11/iPhopne X ready by the developers. New gestures and engagement flow impact usability as well as test automation scripts. In iPhone X, unlike previous iPhones, the user has no HOME Button to work with. That means that in order for him to launch the task manager (see below) and switch or kill a background running app, he needs to follow a different flow. What that means is that at first, the app testing teams need to make sure that this new flow is covered in testing, and more important, if these flows are part of a test automation scenario, the code needs to be adapted to match the new flow. In addition to the removal of the Home button that causes the new way of engaging with background apps, the way for the user to return to the Home screen has also changed. Getting back to the Home screen is a common step in every test automation, therefore these steps need to account for the changes, and replace the button press with a Swipe Up gesture. Authentication and payment scenarios also changed with the elimination of the Touch ID option, that was replaced with the Face ID. While iPhone X introduced an innovative digital engagement with the Face recognition technology, the de-facto today to log in into apps, make payments and more, is still the Fingerprint authentication. Testing both methods is now a quality and dev requirement. From a scan that I ran through the leading apps in the market (see examples below), there is a clear unpreparedness for iPhone X. Most apps will either show on their UI the option to log in via Touch ID or if they support Face ID, they will allow users to use it, while still showing on the UI and in the app settings the unsupported option. Testing mobile web and responsive web apps in both landscape and portrait mode with the unique iPhone X display is also a clear and immediate requirement. I also found issues mostly around text truncation and wrong leverage of the entire screen to display the web content. In addition, trying to work with Hulu.com website proved to also be a challenge. Most menu content is being thrown to the bottom of the screen under the user control, making it simply inaccessible. Obviously, the site is not ready for iPhone X/Safari Browser. Optimize existing iOS apps from both UI as well as authentication perspective. As spotted above, there are clear compatibility issues around the removal of the Touch ID option, that needs to be modified on the UI side of the apps when launched on iPhone X. In addition, scaling UI elements on the new screen whether for RWD apps or mobile apps needs refactoring as well. Apple is offering app developers a ui guidlines to help make the changes fast. Leverage advanced capabilities in iOS11 that best suit the new chipset (AI11 Bionic) and the camera sensors, to introduce digital engagement capabilities around augmented reality (ARKit API’s) and others. Retail apps and games are surely the 1st most suitable segments to jump on these innovative capabilities and enrich their end users’ experiences. It is highly recommended for iOS app vendors across verticals to get hands-on experience with the new platform, assess the gaps in quality and functionality, and make the required changes so they are not “left behind” when the innovative train moves on.